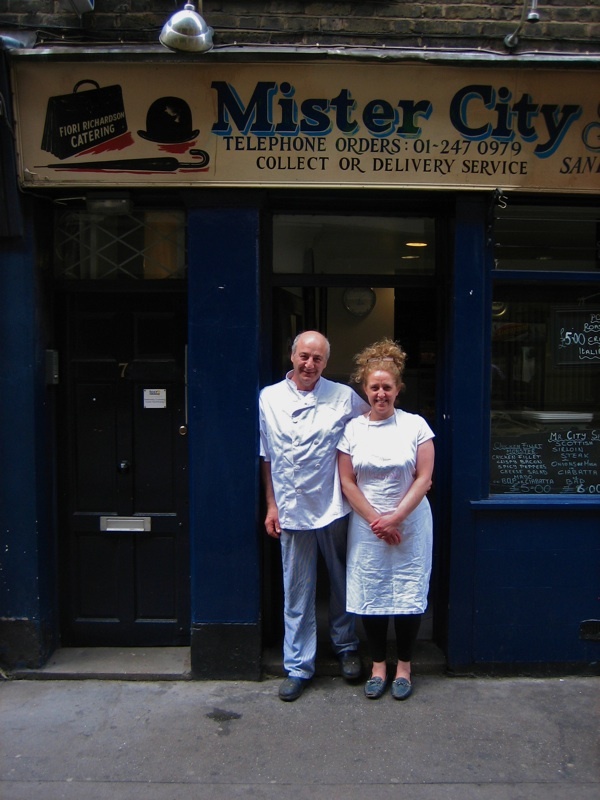 This is Roberto & Mirella Fiori, proprietors of the justly renowned Mister City Sandwich Bar in Artillery Lane, Spitalfields, open weekdays all year round except Christmas Day and Boxing Day. Celebrated among the offices of Bishopsgate and the City, this is the place where the hungry souls of those struggling in the corporate rat race can seek honest sustenance. Open from early, this tiny family establishment with its attractive blue livery and characterful signwriting offers a haven of sanity and good humour in the midst of the madness. When I arrived, the lunchtime rush had long departed and even Artillery Lane itself had emptied out of people. Afternoon shadows were lengthening in this ancient narrow street that miraculously retains the tranquil atmosphere of a backwater despite being so close to Bishopsgate. I found Roberto had ascended from the kitchen to idle on the pavement discussing horticulture with a policemen, from the station round the corner opposite Liverpool St. Yet I was able to persuade him to join me for a cup of tea at his sole pavement table and tell me the story of his wonderful cafe that has such a distinguished pedigree within the noble tradition of Italian City cafes. 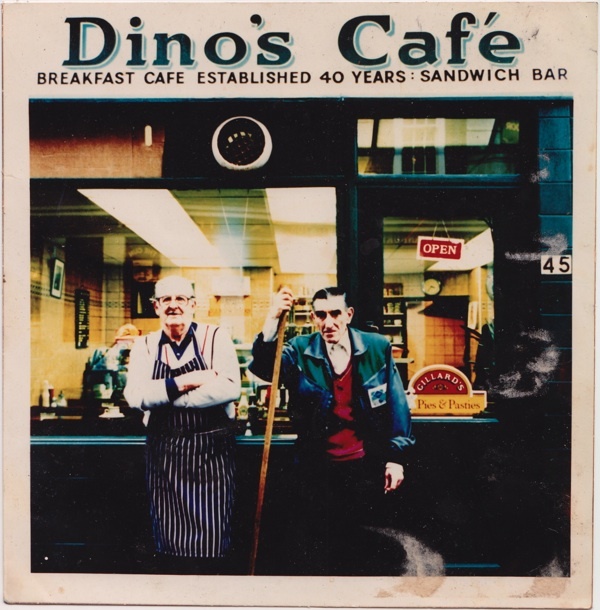 My dad’s cafe was Dino’s Cafe in Crispin St next to the Spitalfields Market and I worked there from the age of twenty-three until it closed, and I’m fifty-eight now. He was the cook for Dino Cura and his brother who first opened the cafe after World War II serving the market porters, and when they both retired at the age of forty-five and went back to Italy, they asked him to take over. Me and my brother Ernesto (known as Ernie) worked there with Terry Richardson (my brother in law), until the Spitalfields Fruit & Vegetable Market moved out to Leyton in 1991. They gave us a space for a cafe at the new market and Ernie & Terry still run Dino’s Cafe there today, while I came here to Mister City with Mirella, my wife, and Danieli, my son. Ever since the crash, all my customers are constantly being shifted around. There’s one guy who comes in here whose job it is to shuffle everybody at the Royal Bank of Scotland. Another customer, he told me there used to be one hundred and eighty people in his division and now there’s thirty-five, and they’re expected to do the same work. We used to have this lovely man, Richard, who came in every day for breakfast and lunch. Then, one day, he came in for breakfast and said, “See you for lunch,” but he never came back. When he arrived at work, they said, “Wait there,” gave him his things in a box and told him, “Your services are no longer required.” He came back after three weeks with his daughter to see us. He said,“I can’t get a job, my wife’s gone back to work.” Another man said to me, “If we make money, we get a bonus but if we make a loss, we just get our wages. We can’t lose because it’s not our money we’re gambling with, it’s other people’s money.” A lot of them have lost their jobs now. I was fascinated by the recognition of mutual difference and the respect that exists between the members of the Fiori family and their customers from the world of high finance. While the rewards are potentially higher for City workers, there is appreciation that the Fiori family enjoy self-respect for working hard in their dignified endeavour over all these years – producing good quality food which is superior to the chains that surround them. Roberto’s wife Mirella told me she also comes from an Italian family with a proud cafe tradition. “I used to work over in Scrutton St at the City Way Restaurant in Moorgate for my father Pino Cimelli and my mother Albina, with my brother Luigi.” she explained, “I didn’t want to study when I was at school, I wasn’t very academic, so my dad said, “You’re coming to work for me.”"
“When I’m selling someone a roast pork ciabatta or a nice sirloin steak, I can see their body language, they’re rubbing their hands together because they can’t wait to eat it.” Mirella continued, her eyes sparkling with delighted emotion, “I sell food with confidence, because I know what goes into it. 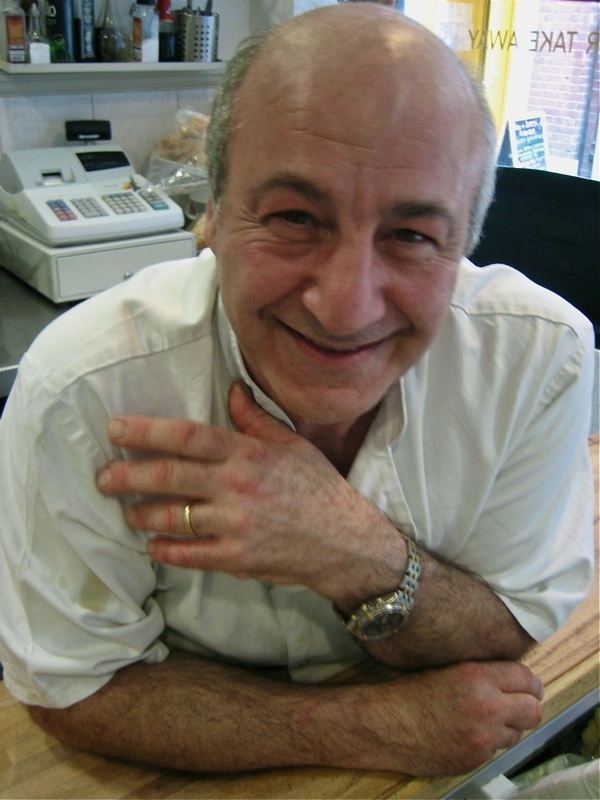 If it costs five pounds, I know it’s worth five pounds.” And the pride of the Fiori family and the triumph of the Mister City Sandwich Bar is that this is a concept of value which City workers have embraced enthusiastically. Roberto’s father Angelo Fiori with Cuzzi the street sweeper in the nineteen eighties outside the former Dino’s Cafe. 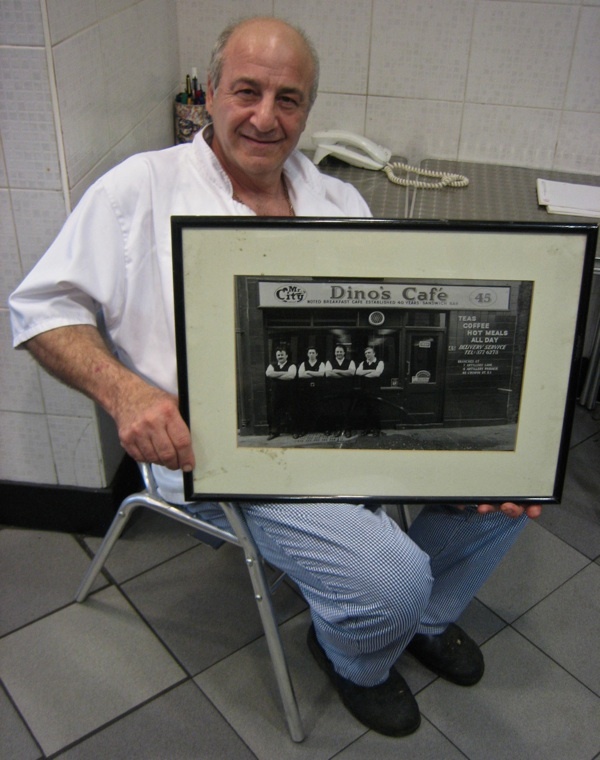 Roberto shows the picture of the former Dino’s Cafe in Crispin St, he is second from the right. I hope the City slickers realise how lucky they are being able to buy proper food at lunchtime. Most of us will be looking forward to an insipid supermarket sandwich. Thank you GA for highlighting this little gem – long may they continue in business. Follow this link to hear ‘Breakfast in Spitalfields’. Have you heard this? Must have been written for you! Marvellous! Restores one’s faith in humanity, like all your stories. Lovely post, as always. You allow me to revisit the “real” London every day from 4,000 miles away. awwww, the old mister city what more do you want. i love this shop and my mum, dad and brother worked very hard to get it where it is today. i appreciate all the lovely comments and it makes me very proud. I wouldn’t go anywhere else to get abused!! The food is great (especially the Linguine)!! Don’t go anywhere else if you want freshly cooked food!! Can’t recommend it highly enough!! M, R and D many thanks for your hospitality!!!! I am that police officer you captured talking plants with Bob – he’s great at cooking them, but Mirella says she has trouble finding the house through the un-tamed planting at home. My job, as the local Ward Constable, is to keep everything running as smoothly as I can on the borders of Spitalfields. Mister City being the hive of activity it is, is a good place to keep in with, and I’m then ideally placed to keep the Peace after Mirella’s abuse! Only joking; they’re seriously smashing people and vital to what makes this area so special. I can’t understand why anyone would go to a bog standard chain in the morning or lunchtime when you can get ‘proper’ food with a healthy dose of abuse (Mirella you know I mean you). Apart from the cracking food, the banter takes you away from your e-mails and Blackberry and actually provides a welcome break from the desk. Bob, Mirella, Dan – you create a well deserved fierce loyalty from your customers, many thanks from one of them! I worked in the City for 10 years; years later in Spitalfields before moving back home to Scotland a few years ago. This brings back fond memories of all the Italian sandwich bars and cafes that provided fantastic service and quality foods to all us hungry office workers! Why on earth you would want a prepacked sarnie is beyond me. These shops knew all their regulars and it was as much about the jovial banter as the sandwiches, cakes or coffee. The cheeriness of the proprietors was often welcome in the stress of the working day. I love this blog, catch up with it every Friday evening and it spirits me back to a vibrant part of London I truly love and miss. Thank you to The Gentle Author. This place was my morning oasis before heading to the office in Bishopsgate. After spending 15 years working nr Aldgate East, it was nice to finally find a place like Sidoli’s on Leman St. I can still see Mirella singing “Do they know it’s Christmas” by Band Aidat the top of her voice when in came on the radio at the run up to Xmas. Much to Danielli’s dismay and slight embarrassment. Thankyou for serving me the best lunchtime food, I think I’ve ever had. I dont get it with places like this why people go for the chains that are all over the place. If i come back to the area again. Mr City is where I will be eating. Great food served by very friendly people. 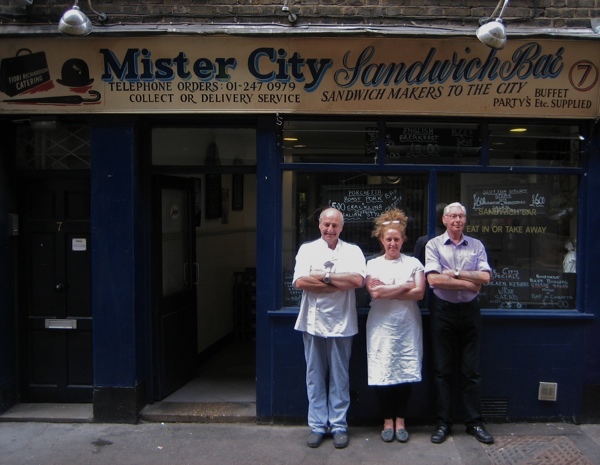 Read about the renowned Mr City Sandwich Cafe on the Net when planning our trip to London this year. So pleased to find you today as we took our walk round Brick Lane, Spitalfields and the Aldgate area. Your food really is as good as people say. Bought a huge wonderful home made bap with breaded roast chicken, home made stuffing and coleslaw. Totally delicious and a perfect lunch. Thanks so much for your friendly service and the interesting info about this wonderful historic area. 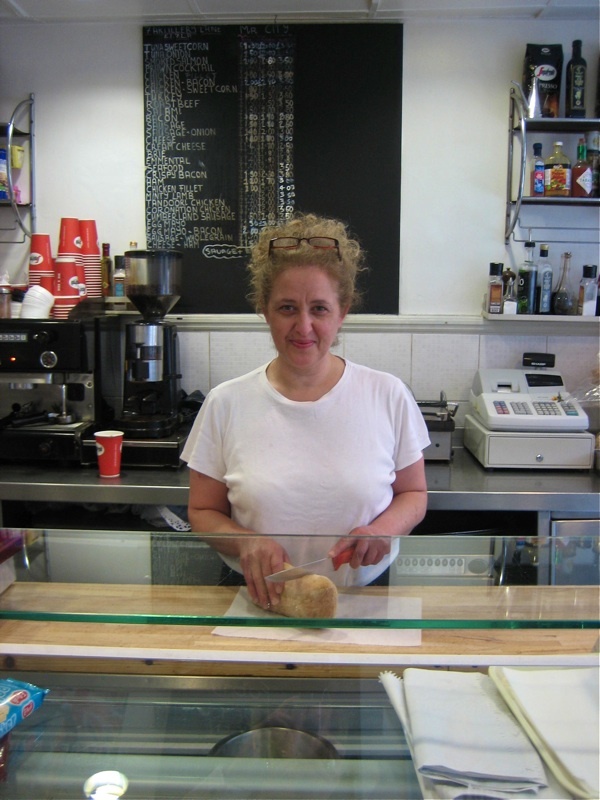 Hoping to see you next time we come over as you make the best homemade sandwiches in London! Are they closed now? We moved office out of the city and it looks like there’s some haloumi place there now. Nooo!